For years, Medicare has maintained a publicly available system of computerized and manualized edits and coding rules, collectively called the National Correct Coding Initiative. The rules also apply, by law, to Medicaid (here). On February 8, 2019, CMS announced that the NEW contractor for managing the edits is Capitol Bridge LLC, in Virginia. See CMS announcement below the break; link here. The consultancy's website is here. The final cutover date (after a transition period) is March 15, 2019. The prior contractor was called Correct Coding Solutions LLC, and was headed by Dr. Niles Rosen. CMS posted some ridiculous new laboratory coding edits in late November 2018, which stakeholders are currently dealing with at the agency level. Many in the lab industry are familiar with the Theranos saga from numerous news articles and from the 2018 non fiction best seller BAD BLOOD. Bad Blood was written by WSJ journalist John Carreyou. Here. Newly minted: Theranos, the podcast mini-series. It's called THE DROPOUT. Hosted by Rebecca Jarvis and produced by ABC, the podcast series runs six episodes and and about 4 hours at 45 min per episode. Find it on iTunes and other podcast aggregaters. Website here. Upcoming: the HBO documentary THE INVENTOR. It premieres March 18. Website here. The website includes the video trailer. For an early review of the documentary, March 8, MedCity, here. 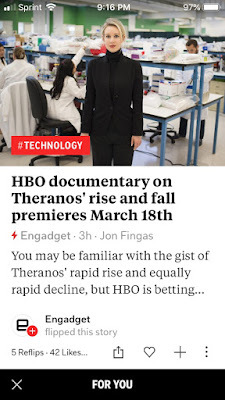 I just learned that there will ALSO be a Theranos documentary on ABC, 20/20, on Friday, March 15, 2019. This TV documentary builds on the Podcast documentary "DropOut." Link here. See a February 2020 update on the last days, and the hereafter, of Theranos, at Vanity Fair, by Nick Bilton (limited open access), here. Someday: I've heard little about a rumored biopic movie with Jennifer Lawrence, but I haven't seen that it's canceled either. The Hollywood rumor mill now pegs it for 2020. Here. My 24-month month running archive of Theranos web articles, some dating back to 2004/2006, here. Most of the links are 2014-2016, spanning the media-fueled rise and fall. Unrelated to Theranos, but another new example of the long-form miniseries podcast as a type of journalism, see Bag Man, about Nixon's criminal vice president Spiro Agnew, at NBC here. (At this website, also available as transcripts of the podcasts). Roche will acquire Spark Therapeutics, maker of the $850,000 retinal drug Luxturna. Roche will value the company at about $4.8B, double the market cap of the prior day. See business news at Bloomberg, Biopharmadive, MedCity. See my January 16, 2019, article on the details of how CMS prices Luxturna - here. Hint - it's innocuous-sounding HCPCS code J3398. Million-dollar drugs get their reimbursement five alphanumeric characters at a time, just like everybody else. Some other gene therapy stocks also rose 15-30%, here. In other news, CMS released a draft national coverage policy for CAR-T biologicals, February 15, here. For a WSJ article on paying for million-dollar biologicals by installment, re Bluebird Bio, here. The National Committee for Quality Assurance (NCQA) maintains sets of measures that apply to health plans (HEDIS) and well as other organizations (e.g. Patient Centered Medical Homes.) As a standards body, NCQA is separate from CMS, which has its own rosters of measures for ACOs, Medicare Advantage plans, etc. Currently, NCQA is accepting public comment on its measures for Patient Centered Medical Homes (PCMH) through March 4, and on Health Plan Accreditation through March 11. See the NCQA home page here. See the web page about each measure vetted for a proposed change, here. Examples of HEDIS changes include dropping a measure that checks whether arthritis patients are prescribed disease-modifying drugs (DMARDs; rationale, a fair percentage of patients don't need them but they're hard to identify in the measure). See a 6 page PDF here. Another measure up for deletion is related to osteoporosis screening, because of "concerns about the validity of capturing the specific evidence-based tests recommended for osteoporosis screening using a survey question." See a 12 page PDF here. Among new measures, one is proposed for pharmacotherapy of opioid use disorder (here). This is a typical example of the measure progression. It's stewarded by USC. That means they shepard it through the NQF process. It's approved and archived in a library at NQF as NQF Measure #3175. Here. The measure looks to, "the percentage of adults [diagnosed with OUD] who receive OUD pharmacotherapy and adhere to continuous treatment for at least 180 days, allowing for 7 treatment gap days." NCQA also has an open docket, based on a 32 page white paper, on how it should approach Digital Health Measures, here. NCQA also has a 35-page white paper on changes to its range of antibiotics measures, here. Don't confuse NCQA with NQF, the National Qualify Forum, which holds libraries of of hundreds of vetted measures which specific bodies like CMS can bring their shopping cart to. NQF here. CMS also maintains a complex Measures Management System (MMS) which keeps most aspects of measures development and measures proposal separate from the inpatient and outpatient rulemaking process itself. (Primarily, just the final adoption of measures goes through notice and comment annual rulemaking). See the MMS home website at CMS here. For example, via MMS, stakeholders can pick a measure already vetted and archived by NQF in its measures library, and propose it to CMS as a future CMS measure. Then CMS can cherry-pick from these public MMS proposals to bring a possible measure or two into the spotlight of annual public rulemaking. The measures then support VBP - Value Based Purchasing by CMS, such as bonuses and debits tied to measure performance. Measures work on slow timelines, for example, NCQA/HEDIS is taking comments now on changes in measures proposed for 2021. CMS also takes comment on measures it plans to implement 2-3 years in the future, in most cases. And these processes all follow the year-plus process for NQF adoption of a measure after submission, as it moves through committees and comment cycles. Very Brief Blog: CMS Launches Podcast Series "Beyond the Policy"
On February 19, 2019, CMS announced it was launching a podcast series, Beyond The Policy. The first podcast features Chief Medical Officer Dr Kate Goodrich on E&M coding. See an unofficial transcript here. See the podcast website here. CMS says the podcast will be released via ITunes and GooglePlay. Take CMS policy discussions with you wherever you go - the beach, the mountains, even overseas. CMS Twitter feeds include @SeemaCMS and @CMSgov and CMSGovPress . The CMS blog homepage is here. In the past several weeks, there have been an unusual flurry of articles, notices, and sign-on letters raising concern about the implementation of Medicare's March 2018 NCD covering the Foundation Medicine tumor gene panel test, and additional unexpected effects of that NCD. FORCE - Facing Our Risk of Cancer Empowered - has released a web page about the topic now. Find it here. "A newly implemented Medicare policy is significantly curtailing BRCA genetic testing for cancer survivors. Medicare has discontinued coverage of germline genetic testing for beneficiaries who don’t have 'recurrent, relapsed, refractory, metastatic, or advanced stages III or IV cancer.' "
FORCE was among 60 signers of a letter of concern to CMS Administrator Seema Verma on January 31, 2019 (here). If the NCD is used to restrict NGS testing to women with Stage 3-4 cancer, it has big impact. Most women who have breast cancer and who qualify under Medicare LCDs (and NCCN guidelines) have Stage 1-2 cancer, when the most preventive actions are possible. As I noted on January 2, there is a highly disproportionate impact on Medicare beneficiaries of Ashkenazi origin (here). FORCE submitted comments to CMS on January 17, 2018, before the NCD was finalized (here). The letter describes "current Medicare policies for Germline testing" - e.g. LCDs (some of almost ten years duration) in every state guaranteeing coverage of germline testing in women with a personal history of cancer and meeting additional NCCN criteria. (Generally, the LCDs match NCCN criteria for patients with a personal cancer history. NCCN has other criteria, not recognized yet by Medicare, for familial history without a personal history). So far as I can tell, while statute (1862a) requires CMS to provide the public with its data sources and rationales, and answer public comments, there were no germline sources or rationales in the proposed NCD and no response to the FORCE public comments and similar public comments, except two. The final NCD remarks that germline testing NCCN guidelines are out of scope (Daly, 2017), and remarks that the NCD does not apply to all NGS method tests, but only those for targeted therapeutics. Both of these remarks are opposite to an interpretation that the NCD applies to germline testing or applies to all NGS method tests. Note: At least on some browsers, this transmittal seemed to be variably accessible on February 20; it should be, here. Myriad. The issue was also discussed on Myriad's recent investor call, where the CEO said the chance of this CMS interpretation spreading to commercial payers was "zero." "The coverage group at CMS indicated in early January that it interprets the Foundation Medicine NCD, as limiting Medicare reimbursement of germline cancer testing to late stage cancer patients. Leading patient advocacy groups, professional societies, and industry groups, including Invitae, have expressed the view that this is a mistake. We're optimistic that this will be resolved in a way that reflects the contribution of germline testing to cancer patients among the Medicare population." "....We are along with the advocacy groups, all of the professional societies, most of the industry are working hard to explain to the folks that CMS as well as the legislative committees that have oversight responsibility that this is based on a misunderstanding, that really the utility of germline testing is to -- in cancer patients, is to identify those patients with the hereditary syndromes because they have the greatest risk of metastasis and recurrence. So really the value in germline testing is primarily in the earlier stage patients and we think they -- this is just a misunderstanding and we're sure that given the opportunities to submit evidence, we and the rest of the community can submit plenty to convince them that this was a mistake and that in fact, along the lines of some of the research that [Chief Medical Officer Dr Nussbaum] outlined, if anything, coverage should moving in the other direction." USPSTF has a several dozen guidances for preventive services, which are updated variably at 4 to 10 year intervals. In March 2017, almost two years ago, USPSTF announced it planned an update of its BRCA-related cancer guidance. USPSTF just released the draft guidance, for public comment, today on February 19, 2019. While USPSTF accepts comments on draft guidances, changes between draft and final are usually fairly small. Find the draft guidance page here. The comment period for BRCA related testing is open until March 18, 2019. There are separate comment channels for "evidence analysis" and "recommendation." The headline news is that the basic recommendation is that women should be screened for high risk family histories, and, if positive, referred to genetic counseling, and, if desired, BRCA testing. This is unchanged. There is an insertion that uses ethnicity/ancestry as a trigger point, in addition to having relatives with cancer. Some USPSTF recommendations have age brackets (e.g. mammography) but the BRCA guidance has no remarks on patient age. Note that these recommendations are dysjunct with Medicare coverage. Medicare coverage for BRCA (and related) testing is currently only in women with a personal history of cancer. Medicare coverage follows the first of two tracks of NCCN recommendations; NCCN recommendations have one track for personal history of cancer, and one track for family history of cancer. USPSTF offers preventive services, so it focuses on care of women without a personal history of cancer. The USPSTF guidance refers in passing to the multiplicity of testing - multigene panels are available - but these aren't highlighted any further in the recommendation document. There are a few remarks around page 39 of the 440-page evidence review document. Based on an HHS ruling shortly after the Affordable Care Act was passed, the ACA preventive benefit for commercial plans must include both genetic counseling and BRCA testing without copay (not only counseling). Here (archive here). In mid-2018, Myriad Genetics acquired Counsyl, a leading provider of large-panel carrier screening for family planning. Beauchamp et al., affilliated with Myriad, have published an interesting open-access paper on the cost-effectiveness of 176-condition carrier screening, compared both to no genetic screening, and compared to minimal screening (such as cystic fibrosis + spinal muscular atrophy testing). The authors find that expanded carrier screening is cost effective (defined as less than $50,000 per QALY gained). Find the paper here at Genetics in Medicine, February 2019. 81412 - Ashkenazi Jewish associated disorders (e.g. Bloom syndrome, Canavan disease, cystic fibrosis, familial dysautonomia, Fanconi anemia group C, Gaucher disease, Tay-Sachs disease), genomic sequence analysis panel, must include sequencing of at least 9 genes including ASPA, BLM, CFTR, FANCC, GBA, HEXA, IKBKAP, MCOLN1, and SMPD1. 81443 - Genetic testing for inherited conditions (e.g. cystic fibrosis, Ashkenazi Jewish-associated disoders [e.g. Bloom syndrome, Canavan disease, , Fanconi anemia group C, mucolipidosis type VI, Gaucher disease, Tay-Sachs disease], beta hemoglobinopathies, phenylketonuria, galactosemia), must include sequencing of at least 15 genes (e.g. ACADM, ARSA, ASPA, ATP7B, BCKDHA, BCKDHB, BLM, CFTR, DHCR7, FANCC, G6PC, GAA, GALT, GBA, GBE1, HBB, HEXA, IKBKAP, MCOLN1, PAH). I had some contact as a consultant with the code application for 81443, which took several cycles before being accepted by AMA CPT. The goal of genetic screening is to provide individuals with meaningful information they can use to guide pregnancy planning based on their personal values. Ethnic-specific, panethnic, and expanded carrier screening are acceptable strategies for prepregnancy and prenatal carrier screening. The Beauchamp paper uses extensive carrier rate genetic analysis combined with extensive modeling of future costs, since no one has used carrier screening and then observed actual outcomes for decades into the future. For example, under ECS testing, large gray box at top, the individual may be at-risk for one of the genes (orange) or not (blue). If at risk (orange), then they may be an intervention (blue) or not (orange) - and so on. For intervention rates if a gene was discovered, the authors modeled 77% observed intervention rates, with 50% and 100% used as comparators. The economics are based on concurrent panel testing for both partners. Arguably (I think) it can be even a bit more cost-effective to test one partner, and if negative for a recessive gene, stop. Had this approach been use (I think) the economic results would have trended only better. In their Table 1, the authors present disease costs. For example, the Duchenne/Becker muscular dystrophy track has a recessive frequency (of conception) of 1:3374, lifetime cost of $1.1M, year 0-3 cost of $53,737, and year 0-1 cost of $7013. This gives weighted lifetime, 3 year, and 1 year costs of $345, $16, and $2. 1- and 3-year cost returns were considered relevant to commercial health plans. Remember, that is just one of the many conditions modeled, so it is just one track of the full cost/QALY analyses. Most models produced 3-year cost/QALY as below $50,000, and cost/QALY was similar to BRCA testing in adults (see their Figure 2). Understandably, cost effectiveness was stronger when lower test prices were used ($500, $1000, and $2000 were modeled). * The code was passed in May 2017, making it too late for the January 2018 annual CPT book. It went through the summer 2018 CMS crosswalk process, with CMS pricing finalized in November 2018. The code was first published for the 2019 CPT book. Note that CMS gapfills or crosswalks all new lab CPT codes, whether they are likely to have Medicare use or coverage or not. On Thursday March 7, 2019, watch a webinar cosponsored by Harvard Business Review, Medtronic, and Accenture on the theme: "How AI Can Change the Future of Healthcare." There is tremendous excitement about how artificial intelligence (AI) could change health care. New AI technologies are being developed to streamline administrative and clinical processes, and venture capital is pouring in to fund dozens of new AI health care startups. Accenture investigated the value of several promising AI applications and found that they could create up to $150 billion in annual savings for U.S. health care by 2026. In related news, see three outputs from Scripps' Eric Topol - a new UK report, a new Nature article, and a new book - highlighted here. According to a February 11, 2019, press release from the Department of Justice, GenomeDx Biosciences Corporation agree to a $1.99 million repayment "to resolve allegations that it violated the false claims act...". GenomeDx is based in San Diego. Press release here. DOJ states, "The United States alleged that GenomeDx knowingly submitted claims for the Decipher test to Medicare between September 2015 and June 2017 that were not medically reasonable and necessary because the prostate cancer patients did not have risk factors necessitating the test, including pathological stage T2 disease with a positive surgical margin, pathological stage T3 disease or rising Prostate-Specific Antigen (PSA”) levels after an initial PSA nadir." This suggests very close application of terminology in a Medicare LCD (L36345). In other cases, MolDx provides brief coverage parameters in an "article," rather than an LCD, or sets up arrangements with providers that are not necessarily memorialized in a public LCD or article. Qui tam actions are common in the lab industry. In a January 2019 article, the SF Chronicle described qui tam employee actions against CardioDx, here. Not new-news, but I ran across a July 2018 article about cases in which recoupments have been stayed by federal judges based on intolerable CMS delays in the appeals process. Worth being aware of. Trade journal article here. If you are issued a recoupment, it is delayed while you are at the first level of appeal (MAC) and second level of appeal (Hearing). However, if you lose at that point, you're expected to repay the money while you separately pursue an ALJ hearing to get the money back. In a case involving a $7.5M recoupment against Family Rehab Inc, a federal district court judge ruled that the recoupment had to be "stayed" or put on hold, because CMS was running an egregious backlog and had far exceeded the 90 statutory timeline for an ALJ hearing. The case sites a 3-5 year backlog, egregiously exceeding 90 days. The party was represented by Foley Lardner attorneys Zaitlin, Waltz, and Donovan. Docketed as Civil Action No. 3:17-CV-3008-K; originating with a ZPIC (Zone Program Integrity Contractor) extrapolation from a $124,000 penalty on 43 manually reviewed claims to a universe of $8M imputed faulty claims. Read the June 4 temporary restraining order here and the June 28 injunction (against recoupment) here. Another example of a Medicare recoupment, $2M, from Biotheranostics, 2018, here. For an $8M case involving Caris, 2018, here. For a $60M case involving Inform/Miraca, 2018/2019, here. A few weeks ago, I posted some background and links on Medicare's decision on CAR-T therapy (here). In September and November 2017, I had posted there were obvious holes and gaps in press articles about supposed value based pricing for this class of drugs (here, here). Fierce Pharma later reported that "CMS quietly canceled" the rumored, indication-based pricing (here). On Friday morning, February 15, 2019, CMS released its proposed national coverage determination on CAR-T therapies. Therapies (whether inpatient or outpatient), are covered, but there are some (commonsensical) requirements on the hospital and the patient must be in a CAR-T outcomes registry. There is also a clause for coverage that is not necessarily on-label, but endorsed in a compendium. Early press from Reuters here. Trade press at Biopharma Dive, here. Modern Healthcare, here. MedCity News here. The full NCD is online at CMS, here. Full text of the decision is clipped below the break. For the full NCD, which prints at 56 PDF pages, see online. Comment is open for 30 days (to 3/17/2019). Kymriah and Yescarta CAR-T's are not the most expensive CMS drugs; Luxturna is, at $900,000 (here). The NCD appears to cover autologous treatment (patient's own cells, re-engineered), but there are efforts underway to potentially use non-autologous CAR-T cells also (MedCity, here; companies include San Diego's Allogene Therapeutics). Scripps has scheduled its 2019 "Future of Individualized Medicine Conference (FOIM)," which will be Thursday/Friday, March 14-15, 2019, in La Jolla. It's the 11th annual event. See the agenda here. Registration through March 4 is $450 (on site, $550). On the third day, Saturday, March 16, there will be a separate workshop on implementing precision medicine. For the extra workshop, registration is $450, or for $500, if you also would like PGX testing from OneOme. Eric Topol chairs the conference; he just supervised a 50-page "Topol Report" for digital medicine in the UK NHS (here). In 2019, the newly renamed Future of Individualized Medicine (formerly Future of Genomic Medicine) conference will expand to include additional perspectives on how to tailor medicine to the individual. Individualized medicine takes into account a person’s genes—and genomics will remain a core topic for exploration and discussion—but it also considers the full spectrum of a person’s uniqueness from their biologic, physiologic, anatomic, lifestyle and environmental information. The Future of Individualized Medicine conference will thus incorporate perspectives from the emerging fields of digital medicine, artificial intelligence and machine learning, behavioral science and others. This is truly a multidisciplinary forum designed to accelerate the transformation of medicine. It's official, the Theranos documentary on HBO will premiere on Monday, March 18, 2019. From Endgadget, here. From HBO, here and here. For an interesting article at Forbes from a family that knew the Holmes's well (and got sued by them) here. For a new Vanity Fair article on the "last days" and EH's personality, here. The "Discoveries in Health Policy" archive of a couple hundred Theranos links from 2006 forward, here. My blog on how the Theranos book unveiled the rarest of rare events, an true FDA reviewer confidentiality leak, here. Very Brief Blog: McKinsey Publishes 80 Page Monograph on Precision Medicine "Opening the Aperture"
McKinsey has published an 80-page monograph on precision medicine, "Opening the Aperture" (28 mb). See the landing page for an introductory article here. Click near the bottom to download the full length PDF version. Authors are Aptekar et al., most in the Silicon Valley office of McKinsey. One of the most important, frequent, and best understood cancer risk syndromes is Lynch Syndrome, which causes elevated risk of colon cancer (here, here, here). Adequate screening for Lynch Syndrome is considered a public health issue. Medicare defines inheritance of high risk for colon cancer, however, without any reference to genetics or Lynch syndrome. That means, for example, in a family with Lynch syndrome or familial polyposis and four offspring, Medicare blindly classes all four offspring as high risk for colon cancer, regardless of the fact that genetics will "de-select" two of them as not having inherited the relevant dominant gene. Medicare's benefit system for colon cancer screening (ranging from FIT to colonoscopy to Cologuard) is here. The regulations, from 1997, defining "high risk Medicare beneficiaries" are here. Given the lack of genetics, they could as well date from 1897. It's like they never heard of Gregor Mendel, or Watson & Crick. IBD (Crohn's or ulcerative colitis). Note that Medicare considers a personal history of Stage 1 or 2 colorectal cancer a justification for annual colonscopy ($1000 plus each year) but (in a current scandal) not a justification for one time only Lynch panel screening (about $700). In lat January 2019, Illumina announced that a version of its Trusight NGS tumor panel is under review at FDA, and further, that FDA had granted it "breakthrough status." The test is aiming for "pan cancer" labeling - the same status that the Foundation Medicine FDA CDx test has. In addition, the test is planned to report tumor mutational burden (TMB). So far, there is no FDA-approved pan cancer IVD to compete with Foundation Medicine in both FDA status and pan-cancer profiling. A pan cancer IVD would be available at large hospitals, academic medical centers, regional reference labs. If it can be run profitably, it could be a significant competitor to FMI, or at least, shake up the marketplace. Coverage at Med Tech Dive here. Press release here. Illumina's most recent quarterly investor call transcript, January 30, 2019, here. Illumina had 4Q revenue of $876M and free cash flow circa $200M. Revenue for the year was $3.4B. In related news, the VA set up a $111M contract (cumulative; 5 years) with Foundation Medicine to provide services to its patients, including F1 CDx, F1 Liquid, F1 Heme - here. Over 60 groups sign letter to CMS administrator Seema Verma, asking to halt an "interpretation" of the 2018 CMS NCD that would now act to block germline testing in cancer patients (with stage 1,2 cancers). This is likely over half of BRCA testing, as breast cancers are usually detected before stage 3 and 4. However, I think for multiple reasons the NCD is itself clearly ambiguous or, taken as a whole, self-contradictory, and that will eventually surface. The very fact that it took nine months for this issue to arise suggests the position is hardly clear. See the ACLA press release here. See the Collective Sign-On Letter online at AMP, here. I discussed application to germline testing as a possible, but likely ill-conceived, interpretation of NCD - here. I noted that MolDx LCDs on germline testing were now, after nine months, being revised to refer readers to the NCD for limits of coverage - here. Genomeweb publishes an article about growing unrest in the oncology community, here. I discussed further in blog here. Washington Analysis Group publishes investor article with headline, "Myriad Genetics (MYGN) & Invitae (NVTA): Medicare Germline BRCA Coverage Halted?" ACLA press release clipped below the break. The crux of the matter is that, while the NCD could be squinted-at and considered ambiguous (for many reasons, read as a whole, and interpreted to avoid absurdity, I don't think it is ambiguous)...in November CMS issued a transmittal on the NCD that contains the wholly new sentence, "A diagnostic laboratory test using NGS is non-covered when cancer patients do not have the above-noted indications for cancer under either national or local coverage criteria." And CMS gave this new sentence an effective date retroactive to March 2018, which raises problematic issues under the statutory voluntary repayment law (here). 360Dx, the sister publication of Genomeweb, reports that Senator Grassley's office has issued CMS a detailed letter asking CMS to follow up on weaknesses in the Clinical Laboratory Fee Schedule triggered by panel unbundling. 360Dx here, Grassley January 2019 PDF here. In part, the Grassley letter to CMS follows up on a November 2018 GAO report on the same topic, here. In January 2019, ACLA characterized the GAO's report as "fundamentally flawed" - here. I wrote about the pending issue in November 2017, here. The GAO report in November 2018 used some graphics very similar to those I had used in November 2017. In July 2018, the House, but not the Senate, issued a request to CMS to report on the lab test unbundling issue, here.